Just look at what some of the big tech stocks have already done. Tech giant Amazon.com Inc. (NASDAQ: AMZN) is up a staggering 44%. Apple Inc. (NASDAQ: AAPL) has risen 18%. With tech stocks like Amazon and Apple near all-time highs, it can feel like investors have missed the boat on tech investment. However, that couldn't be further from the truth. Some of the best tech stocks to buy right now are flying under the radar – and they're easy to find if you know where to look. One product on the verge of redefining modern life in the same fashion as the personal computer is autonomous electric vehicles. You see, self-driving electric cars stand at the convergence of three important and innovative trends – clean energy, technological innovation, and safer transportation. As of this writing, more than 1 billion gas-burning vehicles are used every day – and that's just passenger cars. Trucks, motorcycles, and vehicles using combustible engines use immense amounts of oil. Burning fossil fuels is one of the leading causes of greenhouse gases, which many believe are driving climate change. With carbon emissions expected to rise an additional 100% by 2035 without substantial intervention, limiting the carbon output of traditional gas burning vehicles is imperative. And that's where self-driving electric cars come in. 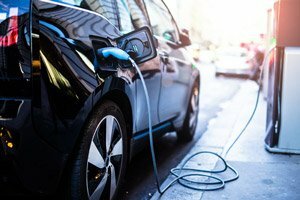 Because they limit the global net consumption of fossil fuel, autonomous electric cars are a crucial part of limiting carbon emissions – and will play a tremendous roll in future green investments. Electric cars are also expected to play a vital role in improving vehicle safety and navigation. You see, autonomous vehicles can sense and reduce driver error – saving lives and making traffic accidents a thing of the past. Because of the clear benefits in safety and navigation, analysts believe that the self-driving car market will increase tenfold in fewer than 10 years, jumping to a value of $556 billion. And we've identified one company that's going to ride this boom into immense profits. It's a major tech firm that's going to play a vital role in the mass production of electric autonomous vehicles. What department of the government is supplying the money for this payout?